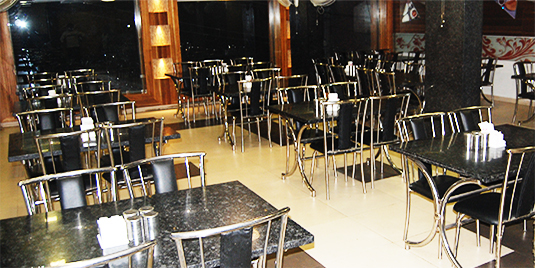 We started luxurious hotel with Pakwan Dinning Hall (A/C) in the month of May - 2003 for homely comfort stay and delicious foods and breakfast respectively.The Hotel City Palace, hotel in Dwarka, is centrally located within walking distance of 5 minutes from the main temple of Lord Krishna and 1.5 km from railway station. Visitors regularly staying in our hotel from Jamnagar district, other state of our country and NRI. During their Dwarka visit, after Darshan of Lord Krishna , visitors heartly satisfied with Bhaktiras.During a year about 20 lacks visitors coming for Darshan from country and abroad.The Hotel City Palace, one of the luxurious hotels at Dwarka, is famous for facilities and we take serious care for our image and giving full satisfaction to the customer by alert administration. Dwarkadhish temple very near from our hotel on 5 minutes walking distance.Our Pakwan Dinning Hall (A/C) serve Gujarati, Marvadi, Punjabi, Chinese & South Indian foods and also routine breakfast. In addition we serve Tea, Coffee, Milk, Bournvita, Cold Drinks & Mineral water.We arranged best staff having good manner, honest & quick in service. More our one partner is available for 24 hours in hotel for visitors facilities. We accept all major Credit Cards & Debit Cards.We giving you assurance that you will be fully satisfied by our Hotel facilities and Pakwan Dinning Hall (A/C) foods items. We started luxurious hotel with Pakwan Dinning Hall (A/C) in the month of May - 2003 for homely comfort stay and delicious foods and breakfast respectively. The Hotel City Palace, hotel in Dwarka, is centrally located within walking distance of 5 minutes from the main temple of Lord Krishna and 1.5 km from railway station. Late Prime Minister, Indira Gandhi after regaining power visited Dwarka, by helicopter and saw some remarks in the Arabian sea (Ratnakar sagar) although they were of jagatpoint cape, big light house on western coast at Dwarka, which she considered a sunken ancient Dwarka and sanctioned adhoc budget to explore under sea bed at Dwarka & Bet up to Prabhas (somnath). National oceanographic institute at Dona-paula, Goa since 1981 started exploring & observing under water. Cultural heritage of India through marine Archeological unit M.A.U. which explores every year in January different places under water-ancient structures under sea as old as 2000 B.C. The thermoluminscence dating of pottery from Bet-Dwarka connected with Lord Krishna EPIC of HARIVANSH (HV) BHAGVAT (BG) & MAHABHARAT (MH). Late Indus type seal of conch shell (20 x 18 mm) engraved with composite figure of bull, unicorn goat (3 headed) 1500 B.C. was found in offshore excavation at Bet Dwarka. Such seal corroborates reference made in Harivansha to the regulation that every citizen of Dwarka should carry this seal as mark of identification for measures to defend after Salvais attack. Dwarka such was found from Mahenjo daro & late Indus civilization. Such seals with motief of dragon with exaggerated eyes were found at Bahrain, suggesting trade connections with Dwarka. also votive pottery vassal inscribing post Harrappan script pictorial script-worshipping. Sea bad was also sound in Bet Dwarka shore inscribed under meanding sea Lord protect 'It is old Indo Iranian language. This specifically indicates that Lord Krishna was not a myth but reality. Main Dwarka has Trilokya Sunder Jagatmandir, formally sabhanmandap with five stories that were constructed. Temple was built on (Chhatri''s) 7 domes built by grate grate grand son Vijranha of Lord Krishna. This temple is built without the use of lime & cement. Bet Dwarka was Durjay Vari Durga Island known as Shankhoddhar formally after Yadavshthali destructed Bet, Yadav families only Aboriginal Adivasi & fishermen's families were staying, however maintaining few brahmins doing Lord Krishna's worship on small temple, around 13th century. The king of kachahha (Krishna's devotee) invaded. For taking away Lord's idols, two Guagli Brahmins Hindu Hiravi & Madhu Pujari gave their life (in 1270 A). In their memory two samadhi palia are set on the steps of temple. Shri Vallabhacharyaji when visited Dwarka in 1497 A.D. There was no idol in amin temple because of Muslim invasion. Original idol was protected in Savitri (vav). Instead small Murthy with sindur was worshiped. The same was later on taken by devotee Parvat Mehta to mayagor. By then Akbar's mother, (Aji Koka with help of Adivasi Kabtribe in absence of Adivasi to put Dwarka to fire. While defending, Aboti Brahmins, Mahajan Bhohanas), Gugalis requested Shiva sanga to protect main idol which was than transported to bet Gaushala. Meanwhile as Vallabhacharya got a dream that idol sculptured by Rukshmani (while in exile because of Durvasha's curse) was being buried under the hillock about 2 km. north to Dwarka now known as Ladava village, was in Dwarka temple temporarily, RAj Jam Ravel did Pran-Pratishtha of that local beautiful idol in Bet temple in 1560 AD. As original idol was found by Aadi Shankaraharya it was traced by local Brahmins & reestablished in main temple at main Dwarka also by JAM RAW from KUTCH then brought idols of Madhavji, Purshotamji, Devkiji & Gardudaji from Pindarak (about 35 kms east of Dwarka) to Bet Dwarka, along with the idol of Trivikaram from Madhavpur & the idol of Laxmiji from Rukshmani's Mandir at Dwarka. All were put in Bet Dwarka's temple complex with the help of JAM RAWAL who had a big festival then. This sacred deed helped JAM RAVAL to establish Jamnagar - then known as Nagda or river Nagmati 140 kmts to Dwarka - now a district headquarter and earlier known as CHHOTAKASHI where in JAM RAVAL & his dynast invited various PANDITS from Gujarat to inspire religiousness in the people. Bet Dwarka now is abode of 20 Vishnu temples, 23 shiv temples, including well known Dhingeshvara, Nilkantheshwar, Abhaya, Dhara shakti peeths along with other 14 Devi temples. Nine Hanuman temples including well known Hanuman Dandi & 84 Choryashi Dhuni Inscription at very ancient temple of Shakhnarayan Dasavtar temple suggested that during Samvat 1774 (1718 AD) Maharao Pragji did repairs to all these temples. Again repair was done by Queen Jhale Chhot Rani in samvat 1852 (1796 AD), as their sons for ma tool Bet idol to Mandavi in samvat 1320 (1270 AD). Bet has glorious history as Meera again appeared in Bet. Nana Saheb Peshava (last leader of 1857 independence) passed the last years of his life in Bet Dwarka. Puja in Bet Dwarka is up till now done as directed by Goswami Vithalnathaji during his visit in 1567 AD. Bet Dwarka was adobe of several Sufis, Haji Ali, Haji Karmani, Gevalsda, Joda & other, since early 2nd century when sufis had not yet joined Muslims. Bet Dwarka was very safe place for yadavs being protected by the sea. However invaded by the British people in the end of nineteenth century. Shakti temple at Samiyani Mat is an island about 1 km north to Okha port, also considered to be protecting Goddess of this area. It also has light house inaugurated in 2000 AD. Hanuman Dandi is in Bet Dwarka 5 km north to main mandir complex. One Hanuman goes up 1 mm a year & another Hanuman image goes down 1 mm naturally, where Prem Bhikshu Maharaj of Bihar a professor turned to sanyasi in 1967 AD. established Akhand (continuous) Ramdhun. In Dwarka where over a couple of crores of Ram Jap writing were stored & temple is built near Dwarkadhish temple (about 100 meter west). Hanuman Dandi is a place with peaceful surroundings (sea) on either side & 84 siddha as Dhuni hereby arrangements to stay over night is there. Gurudwara in Dwarka was established around 1960 AD. in the memory of one of the Pyara of Guru Govind Singhji who lived at in Bet Dwarka. Now a big Gurudwara is being established in Bet in memory of Manekchand (dobhi). A yatra from Dwarka but to Amritsar Main Gurudwar was established in end of last century but is now over crowded with Sardarji's for Karseva. Gurudwar houses many pilgrims. It is centrally located hotel at Dwarka. Dwarkadhish Temple, Bus Stand, Shopping Centres are just at walking distance from Hotel City Palace. It is having luxurious A. C., Non A. C., Suits, Spacious rooms with attached baths. 24 hours hot & cold sweet water. It is having round the clock room service, Multi-channel colour TV, Music, Telephone, STD, Fax Service & Laundry Service. It is having secured parking in hotel Campus.Life Comfort is also available. Generator for continuous power supply.Also provides facility of Doctor on call.